Does APPRO cloud camera have to be connected to a computer? 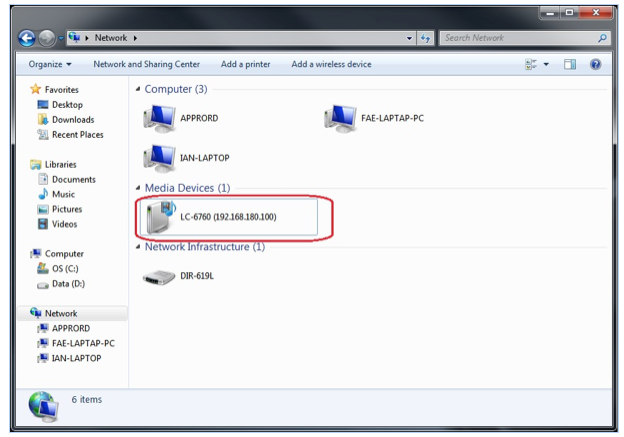 2. a router has been configured providing DHCP server, and APPRO cloud camera connects with this router via an Ethernet cable. In above two ways, APPRO cloud camera can directly be connected with a router which provides the Internet access without further assistance. Can I use APPRO cloud camera outside of the USA? 1. Each camera uses approximately 600 – 700 kbps. 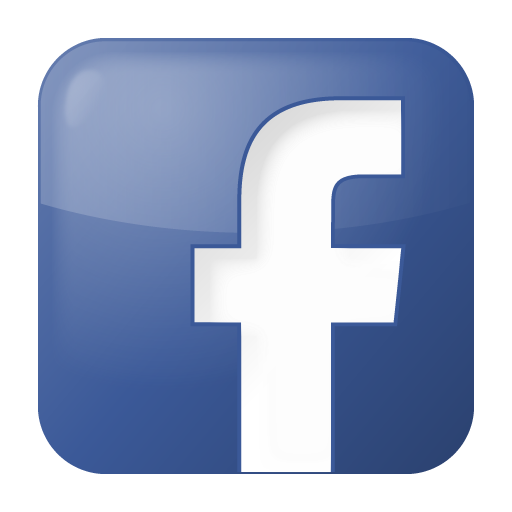 We recommend a high speed internet connection with at least 700 kbps of upload bandwidth dedicated to each camera. Please keep in mind that other devices connected to the same network will use some upload bandwidth as well. 2. You may also want to consult with your Internet Service Provider to make sure you won't exceed any bandwidth cap you may have. For example, many ISPs in various countries have upload and download bandwidth caps of 250 GB/month. 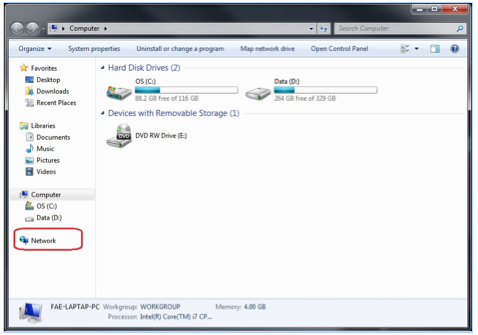 If you need to conserve bandwidth, the best way is to lower down its resolution using. Does APPRO cloud camera have local storage? 1. 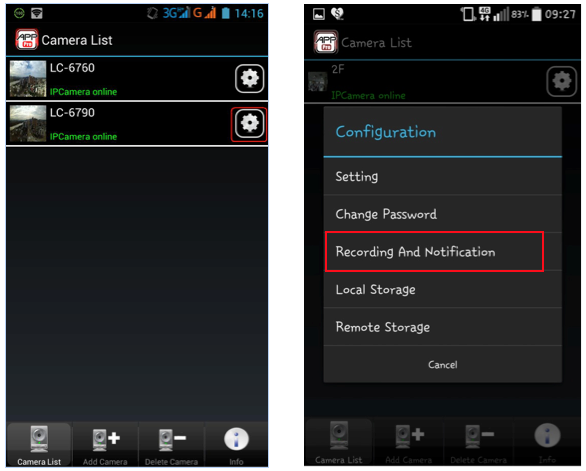 APPRO cloud camera can support SDHC/SDXC SD card as device storage. No matter for constant recording or event triggered recording, it can support too. 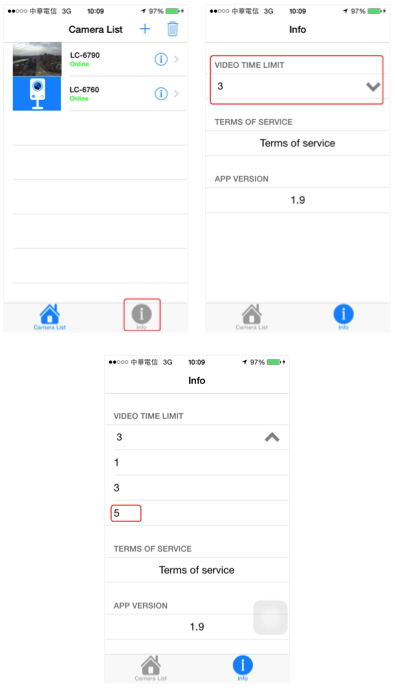 With factory default settings, APPRO cloud camera records a short period of video clip automatically for events. a. 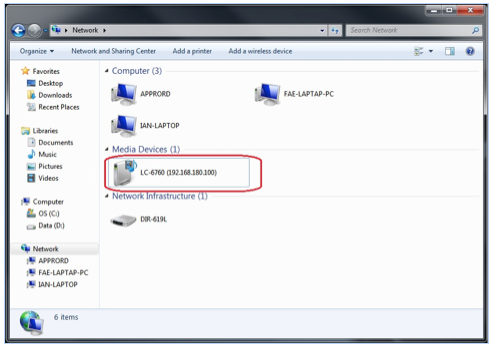 Get a computer and setup /connect it with the same local area network. Due to that APPRO cloud camera supports UPnP feature (it is on by factory default), you are able to find it appears as an UPnP device by going to ‘Computer’ -- ‘Network”. b. 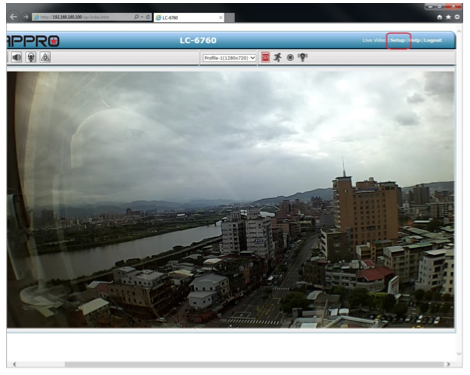 Right click on APPRO cloud camera UPnP device, and select on ‘View device webpage’. 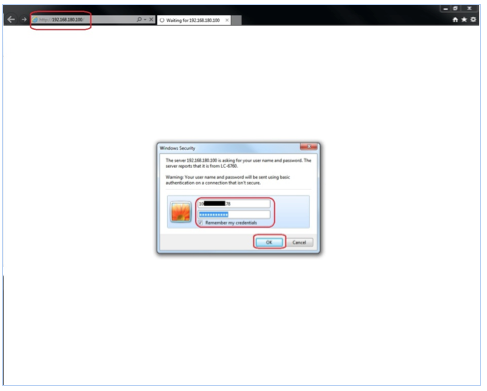 c. Input related DeviceID information and its password for passing authentication. 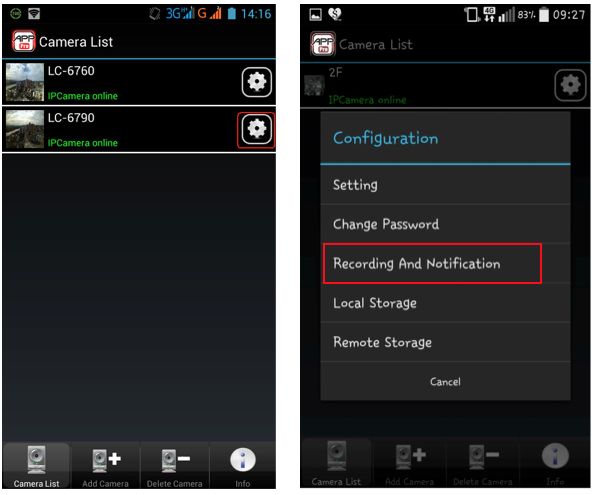 You can find DeviceID information on APPRO cloud camera body. And default password for APPRO cloud camera is ‘9999’. 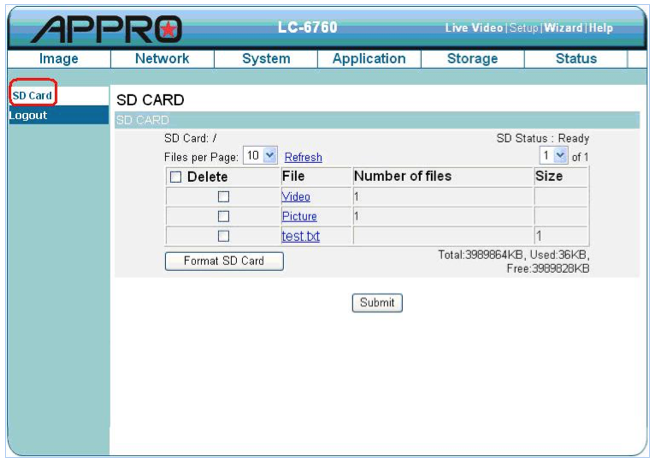 d. You can find SD card page in 'Setup' -- 'Storage' -- 'SD card'. The SD Card page contains two image modes, the Video and the Picture. Click ‘Video’ or ‘Picture’ to enter its sub year-month folder. Click to enter its sub date folder. 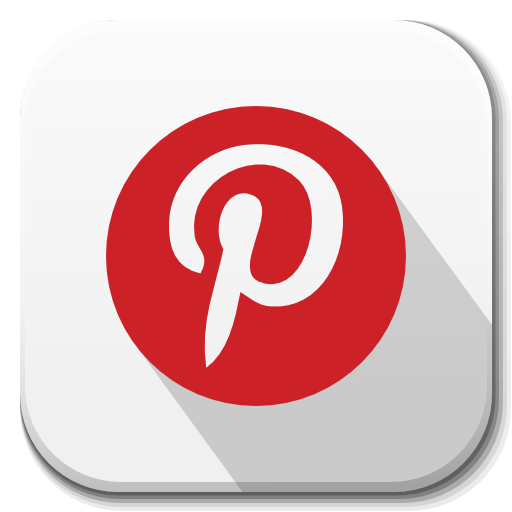 Click the desired file to display the images therein. 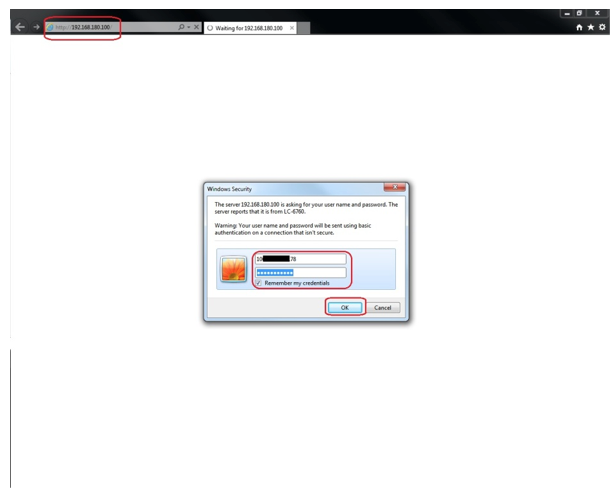 Each file can be deleted by checking and pressing the OK button. 2. 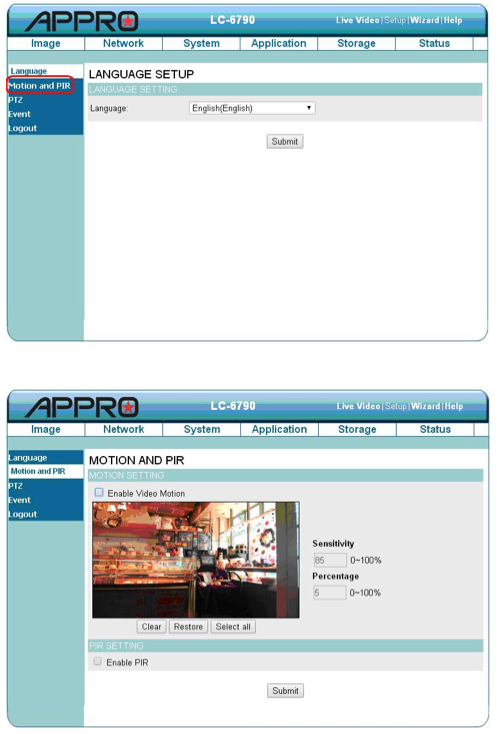 APPRO cloud camera is also an ONVIF compatible device. In this way, video streamings provided from APPRO cloud camera can be retrieved/recorded by connecting it with another ONVIF compatible NVR (Network Video Recorder). Can I connect APPRO cloud camera to a mobile hotspot or Mi-Fi? 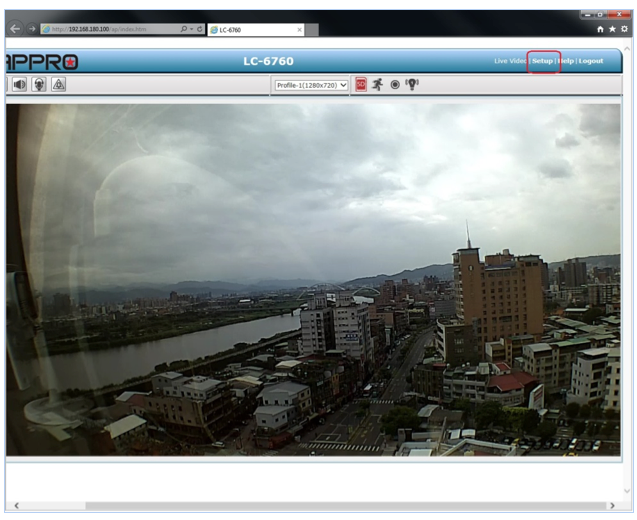 We recommend that you do not stream video from any APPRO cloud camera with any 3g or 4g network. Almost all providers, even those that claim to provide you with an "Unlimited" plan, have bandwidth caps that are extremely low and not meant for constant use. Using any model of APPRO cloud camera connected to a 3G or 4G network will rapidly use up your bandwidth and you will almost certainly be charged overage fees by your service provider. 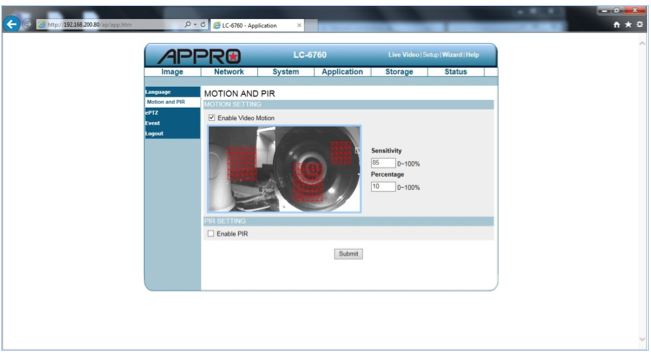 APPRO cloud camera cannot be held responsible for any overage charges as a result of using it with a 3G or 4G hotspot. My video won't load on my Android/IOS APP. See a green light on the front of your camera. See your camera's video by going to camera webGUI on your computer. 2. If you still are unable to view video in your Android/IOS device, force quit the app and sign back in. 3. 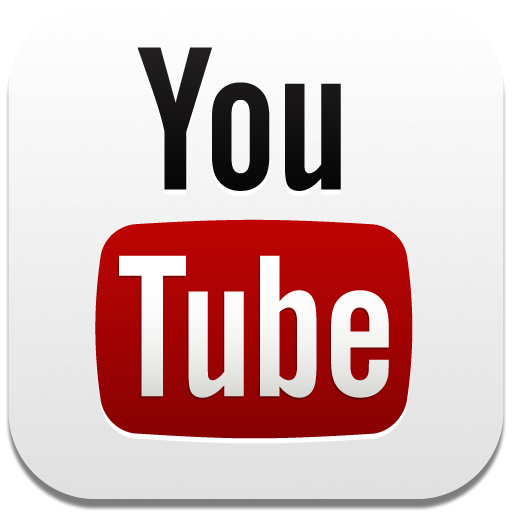 The last thing to try if you are unable to see your video is to view your camera video over a different network. 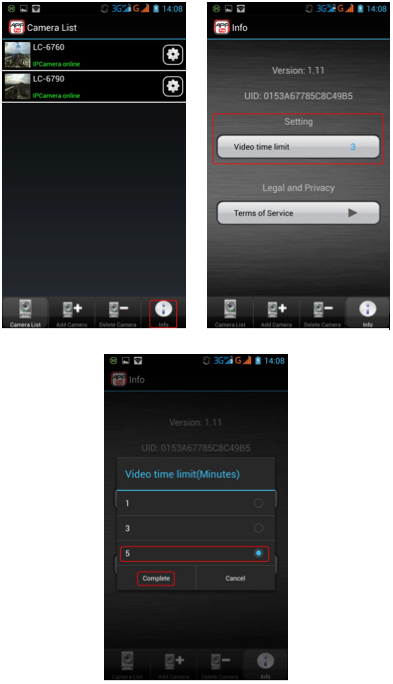 You can view your camera video over Wi-Fi, 3G, and 4G. 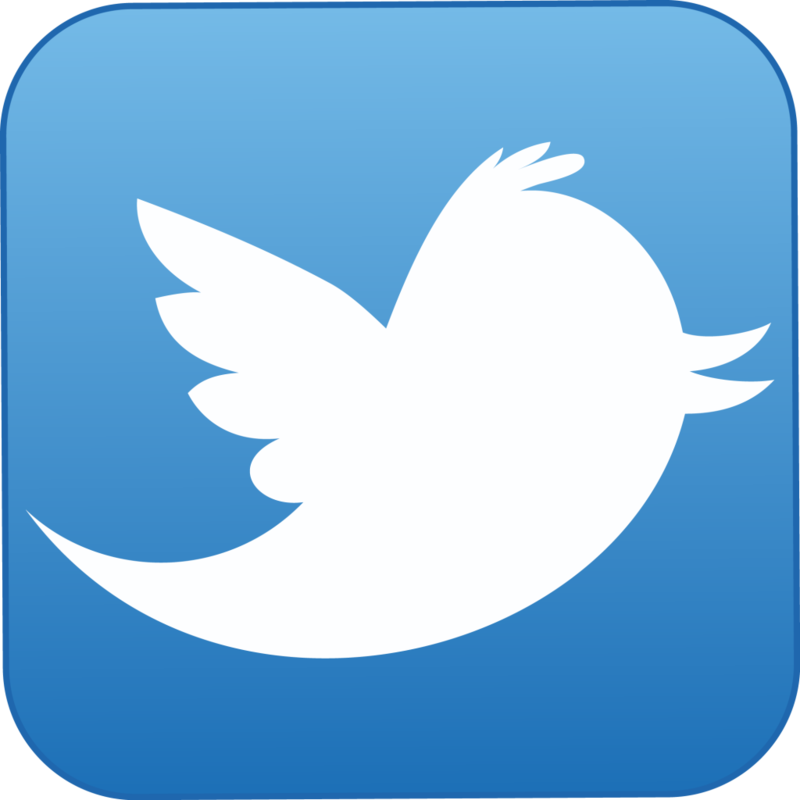 If the network you are currently on is congested in any way, it will hinder the performance of the APP on your Android/IOS device. Please try viewing your video over a different network. Why does APPRO cloud camera disconnect from my Wi-Fi network? If your camera is having trouble connecting to your Wi-Fi network you may have a weak connection between the camera and your router. To test the Wi-Fi signal that your camera is receiving, move your camera closer to your router. Different materials in your home will weaken your Wi-Fi signal, and minimizing the number of walls and ceilings between your router and the camera can help. 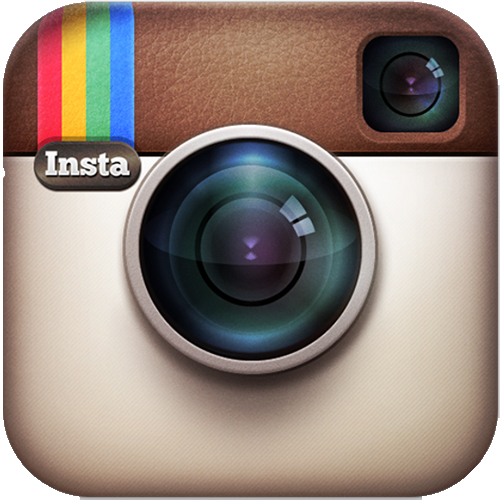 There might be interference coming from other electronic devices near your camera. 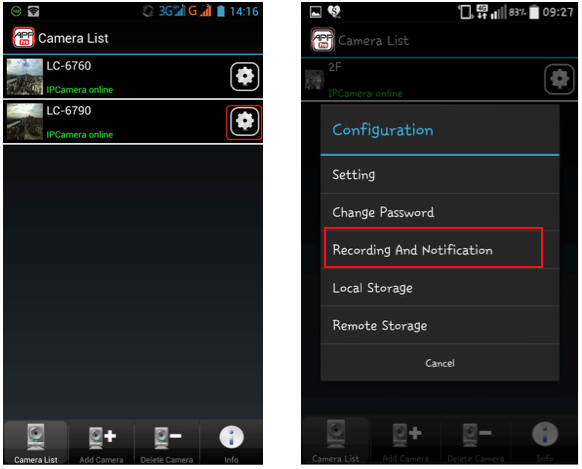 Try to reduce the number of connected devices near the camera. Cordless phones, baby monitors, microwave ovens, garage door openers and Wi-Fi speakers are just a few of many devices that are notorious for causing interference. If your camera is located close to electronic equipment with a large power source, such as a large screen television or home theater system, try moving the camera further away from these devices. Sometimes only a few feet will make a difference. APPRO cloud camera requires a certain amount of available upload bandwidth to maintain a steady connection and stream video. This is different than download bandwidth, used for downloading movies, music or television shows. If you don't have enough upload bandwidth available, we recommend checking with your internet service provider. If signal strength is a challenge and locating the camera closer to your router is not possible, you may want to consider using a "range extender," "repeater," "Wi-Fi bridge" or "Wi-Fi booster". This type of equipment can help extend the range of a router's signal strength or increase coverage. They are especially helpful in large homes or sites where distance and materials may reduce Wi-Fi signal strength. 5. I've tried the steps above, but still no luck. Numerous Wi-Fi networks in the area can also cause a connection issue. We suggest you change the Wi-Fi channel on your router to make it easier for all your devices to connect. 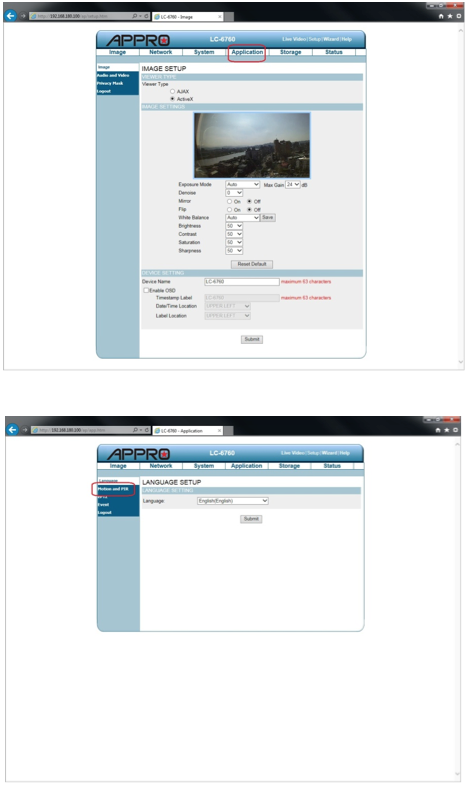 You can reduce resolution for APPRO cloud camera to reduce the bandwidth the camera uses by half. This will help improve the camera's reliability, but it could result in lower video quality. Problems with event push notification. 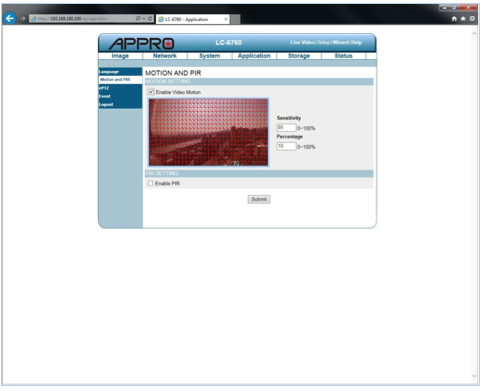 With proper sensitivity decided for different monitoring scenarios, APPRO cloud camera will now detect motion activities. 2. 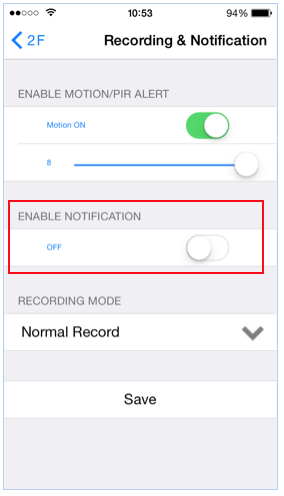 Why there is no any event notifications popped up on your Android/IOS device? 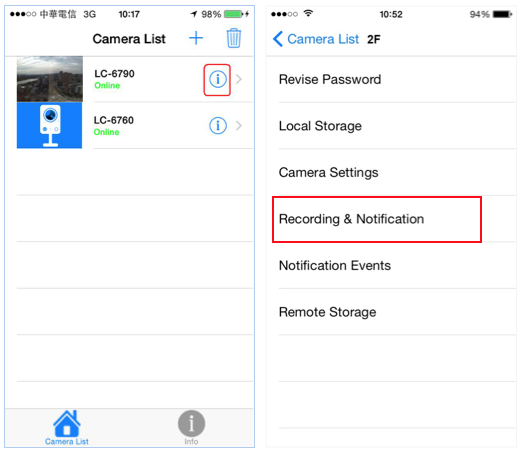 Now that you've made sure that your camera is detecting activities, you will want to make sure that you have also turned on ‘push notification’ function. 3. There is still no any event push notification popped up on your Android/IOS device. 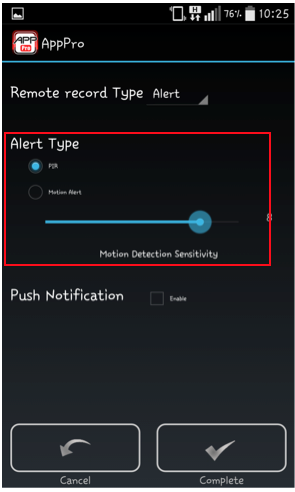 You are able to further configure motion detection function in order to customize any region of interest and its triggering sensitivity via your Android/IOS device or a computer in the same local area network. 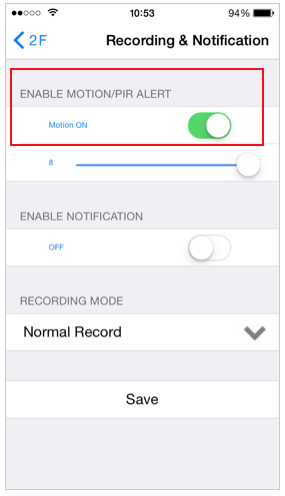 d. You can find control page for motion-related function in ‘Setup’ -- ‘Application’ -- ‘Motion and PIR’. 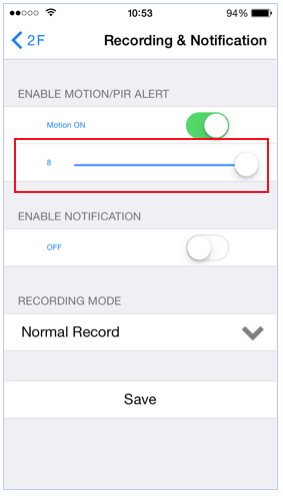 Enable Video Motion Select this option to enable motion detection for your camera. 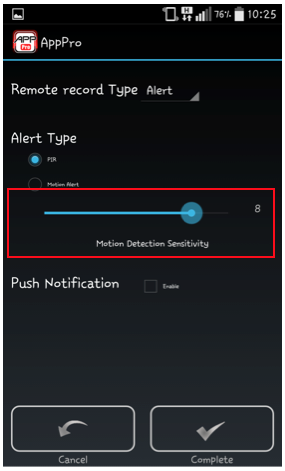 Sensitivity The sensitivity bar allows you to specify how much movement is required to trigger the motion detection. Percentage Adjusting the percentage allows you to set a requirement on how much of the motion window must be filled by movement. For example: If you set this function at 50%, then the selected window must be half filled by a moving object before it triggers motion detection. 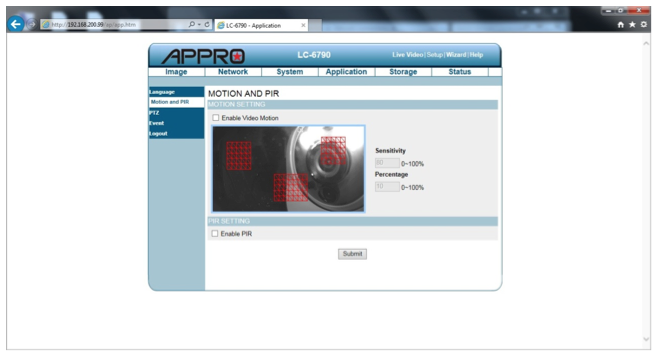 Enable PIR When this option is selected, use PIR (passive infrared) to detect motion. e. Please also be noticed that, in this ‘Motion and PIR’ controlling page, you are able to customize any region of interest in square format. As shown in below figures. You are able to customize different separated regions of interest in the live view window, for example: a door way and a window area. 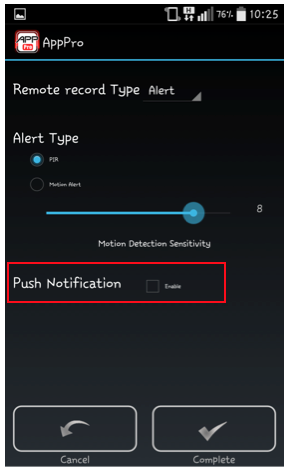 With proper sensitivity and Percentage given, the motion will be triggered accordingly and send push notifications up to your Android/IOS device. How do I change the Wi-Fi network my APPRO cloud camera connects to? 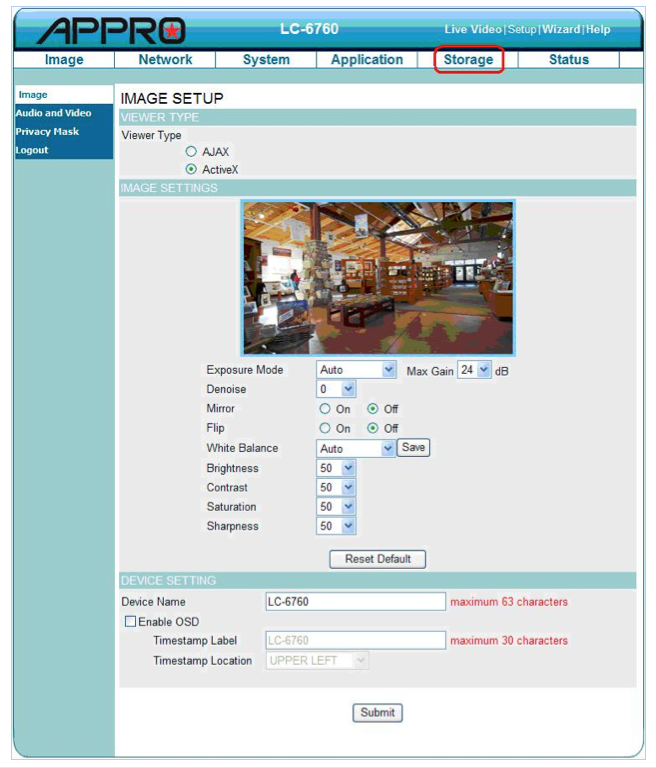 If you've moved your camera to a new address, switched internet service providers, have a new wireless router, or changed some router settings, you will need to run through the setup process for your camera. Why is my image black and white? When APPRO cloud camera is in night vision mode the image will be in black and white. Night vision utilizes infrared light, projected by a number of infrared LEDs built into the camera. Infrared light is not visible to the human eye, so camera converts it to an image that you can see which is black and white. If your camera image is continuously black and white, please check your camera settings to make sure that the night vision setting is set to ‘Automatic’ and not ‘Night mode’. 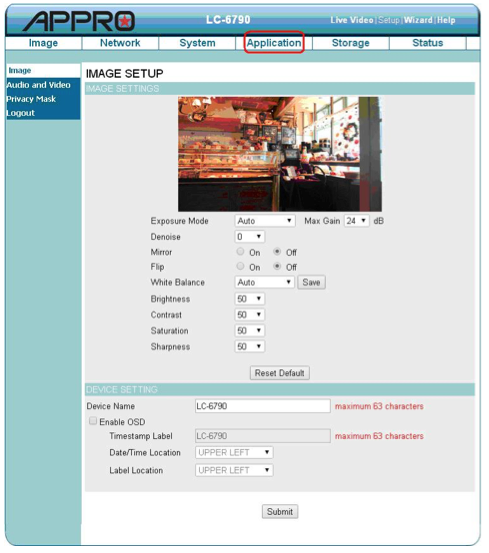 You are able to check it using a computer within the same local area network with your camera, and connect camera webGUI via your browser.